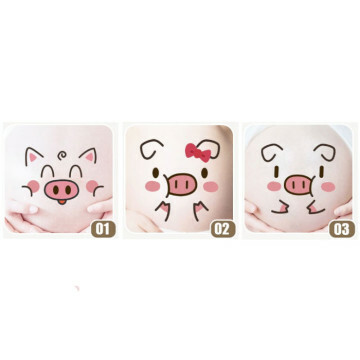 Pig belly sticker for your expecting pig baby! Milestone pregnancy belly stickers for your expecting baby tummy. Each cute belly sticker measures 12cm across and will be the perfect photo prop accessory for your monthly and weekly photos. Just stick onto any clothing or your tummy and snap photo! These make the perfect gift for those expecting and will help any mommy remember their pregnancy in a special way! Everyone loves to see tummy photos, and now you have a great way to let everyone know how your baby girl or boy is growing! Capture your baby belly, together your spouse's food belly with this sticker. it will be a memorable keepsake for both of you! These stickers provides a wonderful way to capture and document each change in your baby as he or she becomes grows within your belly!